What’s the most creative, delicious and fun hobby there is? Baking, what else? When you love to work with food, there is certainly no higher level of skill than learning to be a great baker. You can make so many delicious items for your friends and loved ones, and be known as the ultimate baking sensation amongst your peer. Baking happens to be one of the most creative outlets out there, a place where you can truly let yourself go and give it your best. All you need are the right ingredients, a head full of ideas and the best oven for baking in the market. Sweet or savory, hot or spicy - there’s no limit to what you can make with your baking oven. For the ultimate skill, you will, of course, need to be creative, and go beyond the traditional recipes and test the limits of creativity. Your preferred baking oven, too, needs to be as versatile as you are, comply with your needs and demands. Here in this article, you can learn to choose the best baking oven for your creations, know about the features you should look for. The rest, however, depends on the baker! Why Do You Need a Baking Oven? The easy answer is, of course, for baking! However, there are more than 10 types of ovens that can be used in the kitchen, but the most commonly used ones are microwave ovens, gas ovens, electric ovens, convection ovens, conventional ovens, and an Oven-Toaster-Grill combo. While you can more or less use all of these ovens for simple baking and cooking, you’ll need something very specific to give you the best possible result in baking. Convection ovens are the most widely used baking ovens in households around the world. Since they are usually used for personal baking and cooking needs, they are available under a reasonable budget and in various sizes and capacity. You can choose a very small one for random, occasional use in the kitchen, or a larger one for professional level baking from home. However, if you plan to bake regularly and continuously for your home business, you might need to invest in a commercial grade appliance. Everything that can be baked to eat, can be done so in a convection oven. This includes all kinds of bread, biscuits and cookies, pies, cakes, meatloaves and different kinds of snacks. It’s only the ingredients that differ for your recipes; baking ovens can be used to bake everything that you put inside it. You can use convection ovens for booking or broiling, as well, but they are best used for baking in a home kitchen. These ovens use a heat source to directly heat up food instead of around it, which makes the whole process faster than any other kind of ovens. The entire process of baking is actually more even because a fan inside the convection oven helps circulate the hot air. Convection ovens are more than 25% faster and more accurate than normal ovens, so that they are the best ​baking oven. There are a number of baking ovens available in the market for you to choose from, filled with the features you are going to need for baking. These are not just convection ovens to choose from, but also other kinds. Here are the top 6 baking ovens that you can look into to choose one. You can do much more than just bake with the Breville BOV800XL; you can also toast, roast, broil, reheat and warm your food. As for baking, you can make anything from bagels to cakes in your convection oven. It runs on an 1800-watt connection, and the Element IQ feature provides just the right heat that is needed in your ingredients. This is a rather large appliance, with 18½” in width and 15¾” in diameter, and 11” high; the interiors aren’t that small either, with a dimension of 13¼” x 11¼” x 5¼”. It comes with 9 function buttons that you can use for different kind of cooking and baking recipes, all of them useful. The smart LCD light on the monitor is easy to read; the light changes from blue to orange when it is time to take out your food. The inside is extremely roomy, with enough space for a large cake, a 13” pizza or even six individual slices of bread! You don’t have to adjust the temperature or the time with this oven, because it will do this for you. When you chose from the functions regarding the type of food you are making, the oven will adjust the wattage and the time for you, leaving you to only deal with the recipe. This is a great baking oven for beginners who do not want to bother with the technicalities of baking, i.e. the temperature, the wattage and the time. All you will need to do is to take care of the food and choose the right feature, and take the baked good out after it is done. 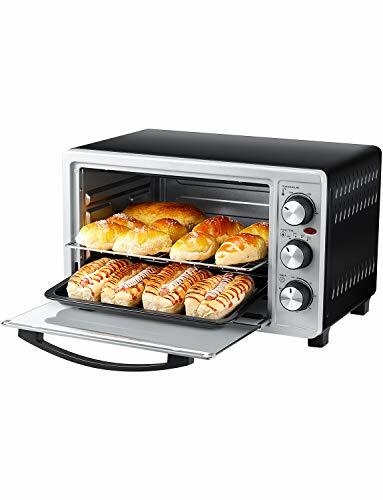 This toaster oven from AICOOK is a great choice if you are interested in making something fast, because this oven is a fast-worker. It is a rather compact size that will perfectly fit on your kitchen counters, keeping enough space for your other smart appliances. This toaster oven is more suitable for making quick breakfast recipes and midday snacks rather than large cakes and pizzas. The AICOOK Toaster Oven has 4 heating elements at the bottom and the top that you can use to roast, broil, toast, bake, cook and grill. It may have a compact body, but you can easily fit a 10” pizza and 6 slices of bread in it, in two rows. The exterior dimensions of this toaster oven are 17¾” x 11½” x 11⅓” which is the perfect size for your kitchens. Inside, you get to move your racks to 4 different positions, away and towards the heat depending on your recipe. You can adjust the temperature from 150℉ to 450℉, with an easy to control knob that you can turn at any time. 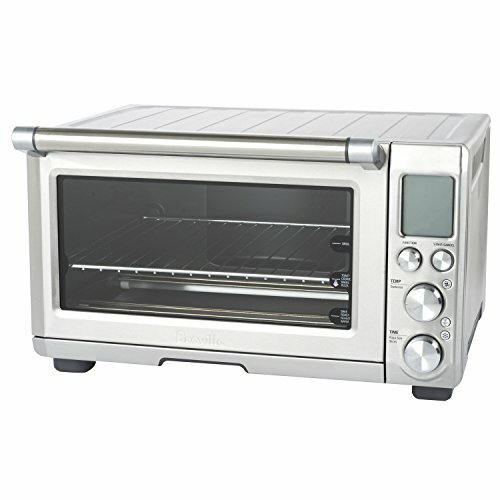 The temperature spreads evenly inside the toaster oven since it is a compact model, and the food is baked perfectly. The oven automatically shuts off after 60 minutes even if you forget, with a loud alarm bell you can hear even from a distance. This is not an oven for your kitchen countertops, but for under-counter installation or to be built into your kitchen walls. These are not very common in household kitchens as they need to be planned ahead while construction on the house is still going on; you can install them later, but that will be more problematic. Also, since this fits under counters, it is rather large in size, with an exterior dimension of 23½” in length, 20⅔” in depth and 23½” in height. The insides aren’t that small either, with a dimension of 22¼” x 22½” x 23⅓”. Besides using this wall electric oven for baking cakes and large stacks of cookies, you can also use the Empava 24” for broiling, baking pizza, and roasting. The highest temperature limit is 450℉, and the heat evenly distributes to all parts of the oven cooking what’s inside perfectly. With this oven, you have enough space to cook multiple food items at the same time, while choosing one setting. You have a choice from a total of 3 settings of cooking and baking method with 3 seperate push buttons; you can place your baking tray and rack in 5 different positions inside, both at the same time, away from the heat source for slow cooking or close to the heat source for browning. The oven window is transparent and the oven has a light inside to watch your food get cooked, and the glass is made with sturdy, 2-layered tempered glass. You can even lock the door with the child safety lock available to keep the hot food away from children and pets, and to stop them from getting into the oven. This is one of the most stylish and gorgeous baking ovens you can have in your kitchen, something that even a professional would love to cook and bake with. The Cosmo C106SIX-PT is also a self-cleaning oven that wouldn’t bother you much when it comes to maintenance and cleaning, since this oven can apparently take care of itself. This oven from Cosmo has a 2 c.u.ft. capacity, large enough for a large family’s everyday cooking needs. 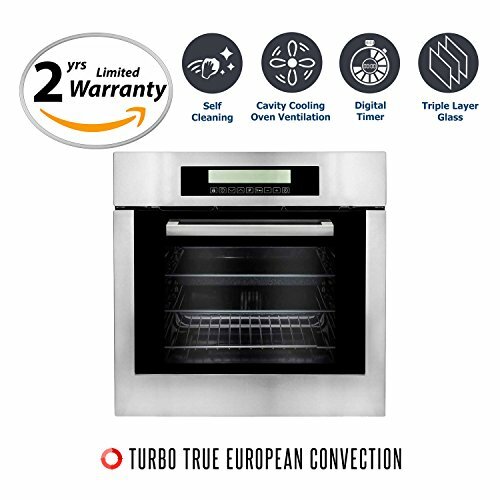 This electric oven comes with 10 functions and you can use it to grill, defrost, bake, and as a convection oven, as well as to cook multiple foods at the same time, bake pizza, fast-cooking, baking cakes and cookies, for keeping your food warm, and use only the top mode for browning. Both cooking and baking are easy in this oven, and of course, fast. The interior dimensions are 17” x 16½” x 12½” with 5 positions for putting in your racks and trays. You get 2 drip trays with this oven and 1 rack, and more can be purchased separately. Besides, the triple-layered, transparent oven door doesn’t heat up even when you’ve been using the oven for a long time, and the stainless steel exteriors are very easy to keep clean. The interior self-cleans, by using high temperature that burns spills and loosens grime, so that all you have to do is to give it a wipe. You can also choose from three layers of self-clean option depending on the level of food residue inside. 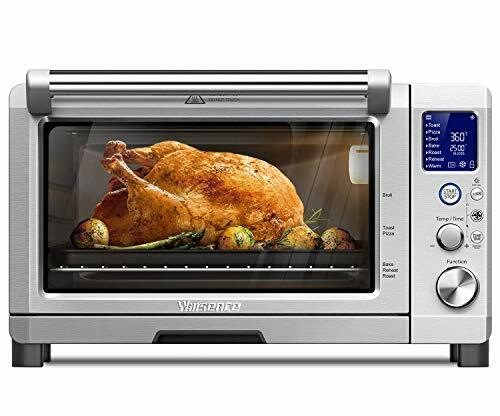 This toaster oven from Willsence may look like a compact model, but it can easily accommodate a 13” pizza or 6 slices of bread inside, which happens to be the standard size of any countertop baking oven. The Willsence Toaster oven comes with 9 different pre-programmed cooking functions that you can use to bake, roast, toast, broil, defrost, warm, reheat, or make pizzas and cookies. You can use this small but multi-functional oven for every single of your baking needs in the kitchen, from a large pizza to simple snacks. The large LCD monitor in the front is easy-to-understand and backlit. You can easily choose between functions with the three knobs in front, depending on your recipe. This is a convection oven so the hot air inside is evenly distributed all around the food, and cooking/baking is done evenly and quickly. The removable crumb tray at the bottom makes it easy to clean inside this oven; the exterior is made from stainless steel and easy to clean. 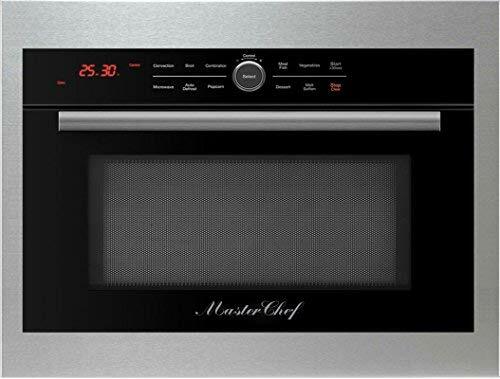 This 5-in-1 oven from Master Chef is something that is perfectly fit for any professional chef or an amateur home maker. It is not only one single kind of oven, but 5 kinds in 1. This is not a countertop oven, but a rather large 24” oven that is twice the size of a regular countertop oven. This is the perfect oven to be built-into your kitchen walls, or to be installed under the counters. However, one of the most unique features of this 5-in-1 oven is its speed. This oven can cook and bake in half the time of a regular convection oven, using half the electricity consumption. You can bake anything from cookies to cakes, bread to pizzas in this oven in the minimum time possible. This is also a great oven for all your grilling and broiling recipes. In case you are entertaining, you can get a large number of recipes done in this oven in a very short time, including hamburgers, grilled steak, pork chops, hot dogs and fish. Whatever the occasion, this is the perfect oven for a large home. You can also heat up your food using the one-touch microwave oven option, always a convenience. The stainless steel exterior is easy to keep clean, and even having such a large oven means more counter space for your kitchen. You can use the top of this oven for working and not worry about heating or scratches, since the stainless steel body is easy to maintain and doesn’t get hot even when in use. 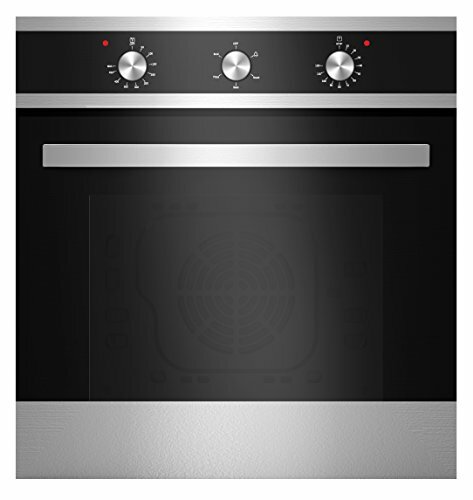 Of course, one of the most important features for buying an oven for baking will be the price and the brand, but there are also a number of seemingly unimportant but necessary features that you should look for when looking. By now, you’ve already been introduced to our recommended baking ovens available in the market in a reasonable price, but now you will learn to look for the useful features to look for in a model before you actually end up buying it. So, what are the features that a good baking oven should have? A lot depends on the size of your kitchen. If you have enough counter space, you can chose a regular countertop convection oven that can be either large or a compact one, and sit on your counters. The compact toaster-oven ones are hardly bigger than a waffle machine or a juicer, and can sit on your counters quite cosily. If you don’t have enough counter space to spare, on the other hand, it is much better to invest in a large built-in convection oven. These ovens are relatively large compared to countertop ovens, but you can install them under your counters, inside your cabinets or even build them inside extra non-loadbearing walls. These built-in ovens can also be installed under kitchen islands and kitchen breakfast tables, and you can easily use the oven tops because they never get hot. Even though you need a baking oven, it is always better if your oven can do more. Some of the ​ovens can also be used for a number of other cooking functions, namely: toasting, grilling, roasting, broiling and reheating. The ovens that have more than one cooking feature means that you won’t have to crowd your kitchen with too many unnecessary appliances. If you choose a multi-functional baking oven, it can mean that you can forget about getting an additional microwave oven, a grill machine, a toaster and even a broiler for your kitchen. The more cooking function the baking oven has, the less clutter your kitchen is going to be. It is a given fact that most baking ovens use up a lot of electricity, and this can contribute to a rather hefty electricity bill. However, some of the recent brands have created convection ovens where the hot air is evenly distributed inside the oven when cooking, which cooks food quickly and reduces electricity consumption. While some recipes need slow cooking, like a roast or a pie, you can use these convection ovens to bake and cook your food relatively quickly. The standard is baking oven space is that you can use it to bake a 13” pizza, 6 slices of bread, or 4 slices of bagels. Anything smaller means that you will have to limit your recipes and serving sizes. Most countertop convection and baking ovens have the standard space inside, but toaster ovens tend to be a bit smaller. Built-in ovens, on the other hand, are larger, almost twice the size. They can be used to cook and bake large quantities of food for a large group of people, within the same amount of time. You may be cooking or baking only one item at one time, but it certainly helps if your convection/baking oven allows you to put in two to three baking trays and racks at the same time. With most models, you have the independence to move around your trays and racks into adjustable positions to be close to or away from the heat source. This is quite helpful is you want to put your food away from the direct heat for slow cooking or close to the heat for browning. However, if you can put in multiple trays and racks at the same time, it means that you will be able to bake a large stack of cookies at the same time, or even make two large pizzas together, cutting back on your time and electricity bill. This is possible in a convection oven where the heat is moved throughout the interior of the oven with the help of a fun, and not in a traditional baking oven where the heat source is direct. Internal light to check out the condition of the food or the status of the cooking, etc. When choosing a baking oven, it all comes down to the price and the functionality. You need a baking oven that will also fit in perfectly in your kitchen, cook and bake quickly with a little electricity consumption, but also be large enough for decent amount of food to be cooked in it. The right baking oven should also be able to not only bake, but perform a lot of other cooking functions that are needed in the kitchen. Of course, all these features, and some of the more smaller ones, should be available in a model that comes within your budget. Whether you are new to using a baking oven or been using it for years, here are some of the questions that you may face while using one, and the answers to them. Why does baking/cooking in convection ovens take a relatively shorter time? Convection ovens have tiny little fans inside them, that allows the heat to be carried to all the corners of the oven. Cooking and baking becomes faster as the heat is distributed more evenly and faster because of this fan. These ovens are around 30% faster than regular baking ovens. Is it necessary to preheat my oven, and why? Yes, all convection and baking ovens need to be preheated before you put in the food. The food should go inside the oven where the environment is already heated and ready for cooking, as well as the pan the food is being placed. This guarantees that your food will evenly receive the same heat in all parts and that there is no chance of the top part getting burned before the insides have been cooked. Can I cook in more than one rack/tray at the same time? This is something that is possible in convection ovens but not in traditional ovens. Since traditional ovens use a direct heat source to cook and bake, you need to make sure all your food is getting the same temperature at the same time. If you use two racks, the one below may not be getting the same amount of heat as the top rack. In a convection oven, however, the heat is carried on in all the corners of the oven with a fan and everything - in both the top and the bottom rack - gets the same temperature at all times. Which type of oven saves money on electricity bills? A convection oven is as much as 30% faster than a traditional oven when it comes to cooking and baking. 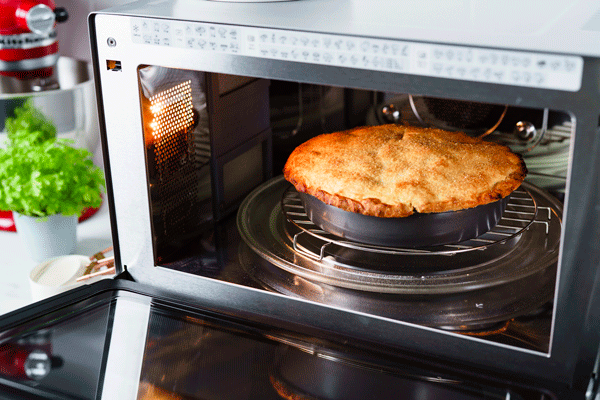 Since it takes less time to cook, a convection oven can save you a considerable sum of money in electricity bills. What kind of baking pans should I use in a convection oven? Regular baking pans, trays and racks can be used in a convection oven, but it is better to use something that is shallow instead of deep. A shallow pan allows more air circulation and takes less time to cook. Can I use a pizza stone in a baking oven? Yes, but the pizza stone needs to be preheated first. You have to place the pizza on the preheated stone and then put it into a preheated oven because these stones take a long time to get heated. Carry-on cooking refers to when you take your cooked food out of the oven but it keeps on cooking for another 5 to 6 minutes because the pan is still hot. This can lead to your food getting burned even if you take it out immediately after cooking is done. To avoid carry-on cooking, it is better to always take out your food a few minutes before it is completely done and keep the pan covered, so that the food can finish cooking in its own outside the oven. If you have waited to take out the food before it is completely done, change the pan for something that is room temperature, and the food will eventually stop cooking and cool down. Why is it better to cook meat and fish in a convection oven? In a convection oven, the moisture stays locked inside the food, making your dishes moist and succulent hours after. This is why, it is always much better to cook meat and fish inside a convection oven than on an open grill or in a pan. Why is there hot air coming out of my baking oven? If hot air is coming out of your baking oven while it is in use, it is a completely normal occurrence. It means that the internal fan is blowing away some of the excess heat in the form of smoke through the door. This will eventually happen if your oven is being used for a long time for a particularly complicated recipe, to keep the control panel and the exterior body cool. Why does the cooling fan inside my baking oven go on running even after I have stopped cooking/baking? If you have finished cooking or baking but the cooling fan is still going on, it means that the oven might need some time to cool down after long use. In most models, the fan will go on working until the oven has come down to a safe temperature or the room temperature, even when you have switched off the power supply. What can be the reasons for my baking oven not heating up? The reasons can be many. For example, there could be a problem with your power source. Again, if the oven itself has been switched off but not heating, it could be that you have not been able to set the timer, or that the timer needs to be reset. Another reason could be that your oven clock may need to be resetted. The malfunction actually depends on the particular brand and model that you are using, and you can find the answer in your instruction guide. What can happen that my oven is taking a very long time to heat? If your oven is taking more time to heat than is normal, there might be a malfunction with the door or any of the other parts of the oven. It could be that there is a small cavity somewhere from which the heat is escaping, causing the oven to take longer to heat up properly. This needs an immediate repair or you can use an alternative cooking function that requires your oven to heat up much more than you actually need for your recipe. Why is my food getting burned? Your internal fan isn’t working and instead of the hot air getting dispersed properly, it is directly affecting the food. Can I use a glass bakeware in my convection oven? You can use glass bakeware in your convection oven but you’ll also have to reduce the interior temperature by 25℉, which means that you will be cook only a few recipes in a glass bakeware. Is it any different if I am using my convection oven in a higher altitude? With any convection ovens, you need to reduce your temperature 25℉ less than what the recipe suggests in a regular baking oven. However, if you are cooking in an considerable high altitude than the sea level, i.e. at more than 3,000 feet above sea level, your temperature needs to be set 25℉ more than what your recipe asks for. When you have a baking oven in your home, all you have to do is to concentrate on your recipes to become the master baker everyone loves to drop by on. You can’t completely focus on your creativity and skills as a baker if you are constantly worried about your oven’s performances, definitely no! So, invest in a good baking oven and you are set for life. You can go on practicing and innovating, creating and experimenting while your baking oven does everything for you. To be a good cook or a baker, you need to surround yourself with truly helpful kitchen appliances and tools, and that includes the help of a good baking oven. Whether you choose a convection baking oven or a traditional oven, a gas oven or an electric one, a countertop oven or a built-in oven, this appliance needs to be one of the top models and brands there is. Otherwise, you can never achieve the level of expertise and satisfaction working with a mediocre appliance. By now that you know what you need to look for in the best baking oven, you can go on and choose a model, and start on creating something truly wonderful for your loved ones and of course, for yourself.